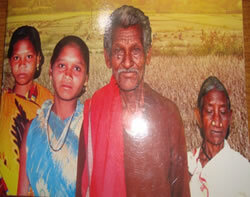 Omanatya are odia speaking cultivating tribal people who live in the north of Jeypore and south of Nabarangpur. It is said that their ancestor was a Minister (Amatya) of Sri Ram. After Ram had gone to heaven there was no one to take care of them and hence they took to agriculture. They are only found in the undivided Koraput district. In Koraput district their population is 17,463 and in Nabarangpur district they number 10746. In the other two districts they number 120 as per 2011 census. Omanatya are largely found in Nandahandi block of Nabarangpur district. Omanatya are divided into two sections i.e. Bodo and Sano. They are good agriculturists and practice wet cultivation. They sing and dance on various occasions like marriage, Pusa Punia and Chaita Parab etc. Their dance are popularly known as Junia nach and Cherchera nach. The musical instrument consist of Mardal, Gini and Thal.